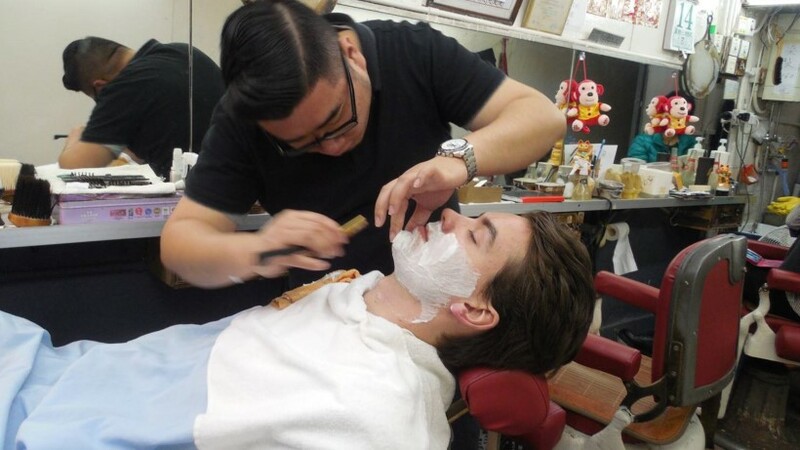 Where to go for a traditional Cantonese shaving experience? My fellow intern Nick and I decided to compare two of Hong Kong Barbers back-alley-style and find the answer to this question. We found the barber in between customers, his feet resting on the arm of one of his classic barber chairs, reading a newspaper. 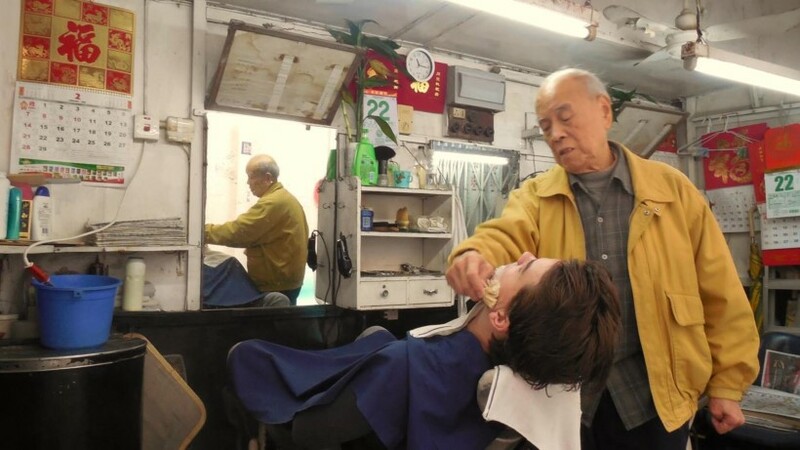 The narrow barbershop at Shing Wong Street has occupied the same six square metres in Sheung Wan for over 60 years. Nick requested a shave and was manoeuvered into one of the chairs. Before he knew it, he was lying horizontally, with a barber cape around his neck. Our back-alley barber is not a very talkative man. Without paying any attention to my touristy maneuvers with the camera, he set to work. Fifteen minutes later, Nick emerged from the little barbershop cleanly shaven, with just one casualty around Adam’s apple. “But,” said Nick generously, “that is a tricky spot.” He had had a hard time relaxing, he admitted afterwards, for it had been the first time he had put not only his appearance in someone else’s hands, but also his life. Anyhow, for a quick shave before you get to work the back alley barber is the perfect choice. To let someone else take care of this daily necessity for only HK$ 50 is an accessible luxury – and in this case, also a very authentic one. One week later, Nick’s beard grown back to the length frowned upon by the typical well-groomed Hong Kong office man, we headed off to Wan Chai. It was on Spring Garden Street where we found Oi Kwan Barber’s, the second ‘back alley barber’ on our list. 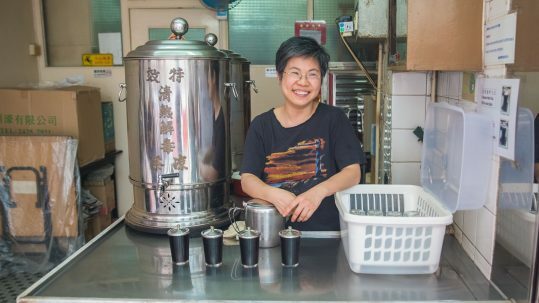 The first time we showed up in front of the barbershop – just as narrow and hidden as the one in Sheung Wan – it was closed. The shop attendant next door smiled apologetically: “It’s unlikely barber Lau will open his shop before 1 p.m., maybe not even then.” The second time we came better prepared: we had phoned to announce we were coming for a shave. 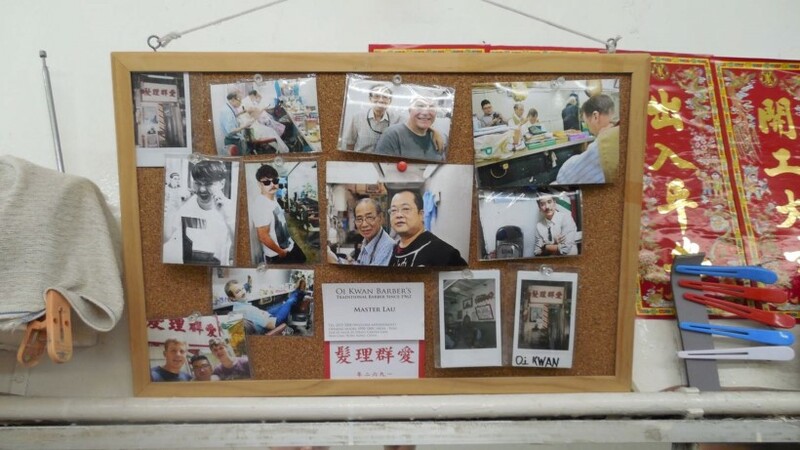 To our surprise, the barber that greeted us was a young man, instead of the well over seventy years old Master Lau that had run the shop for half a century. His father had retired last year, Mark Lau told us, while installing Nick in the chair. But he himself had learned the trade by observing him and had now taken over the shop. Mark proved to be a true grooming professional. For the next forty-five minutes, Nick lay with his eyes closed, now and then the glimmer of a peaceful smile playing around his mouth. Hot towels, foam carefully cupped from an Arlington’s shaving bowl, shaving oil massaged into the skin, Mark swiftly moving around the chair to find the best possible angle, and to top it off perfectly: a burning menthol aftershave and a rich Suavecito creme. Sitting in the chair next to him, my hand stroking my soft and hairless chin, I couldn’t help feeling utterly jealous of this feeling of wellbeing I would never know. The verdict for the 2 Hong Kong Barbers. To compare these two shaving experiences is like comparing apples and oranges. 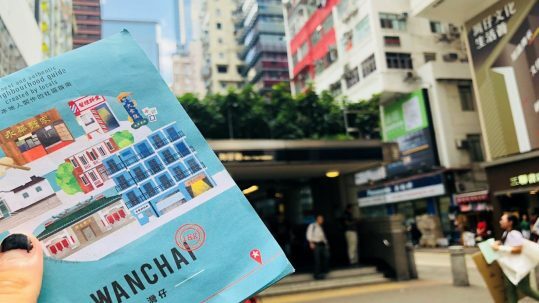 Yes, Nick found the Wan Chai shaving experience truly enjoyable, while the one in Sheung Wan was at times slightly uncomfortable. 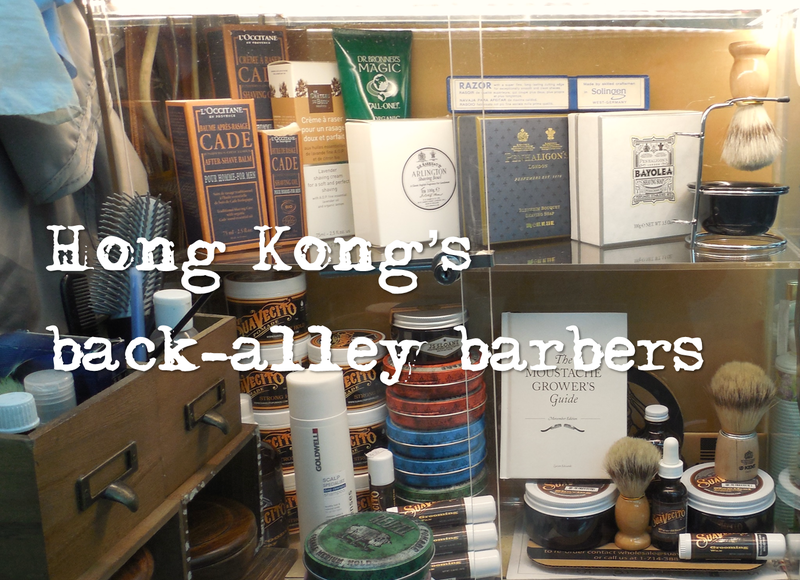 But there is something appealing about the no-nonsense shave of the truly traditional Cantonese barbershop in Sheung Wan. If you’re looking for an authentic shaving experience that will stand out from any other you’ll ever have, and a story that does well at parties, pay the Shing Wong Street barbershop a visit. If you have the time, simply want to lie down and relax – and if you are willing to pay HK$350 for a shave – give Mark Lau a call. 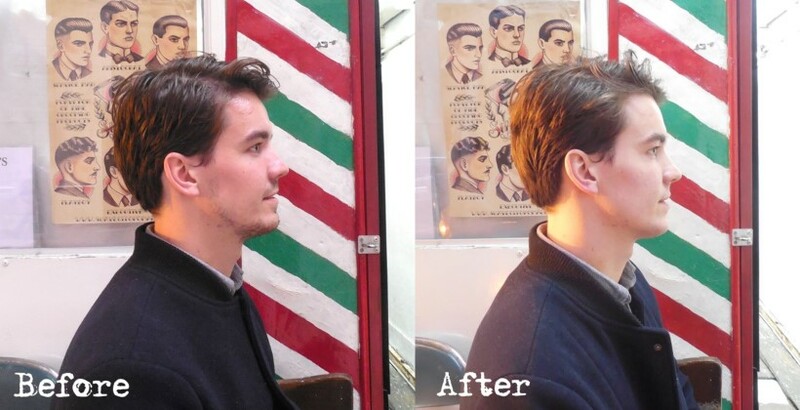 In the end, it’s all about what walks out of the barbershop: a man cleanly shaven, ready to take on the world. Shing Wong Street barbershop (down the steps on your left), Sheung Wan, HK$50. 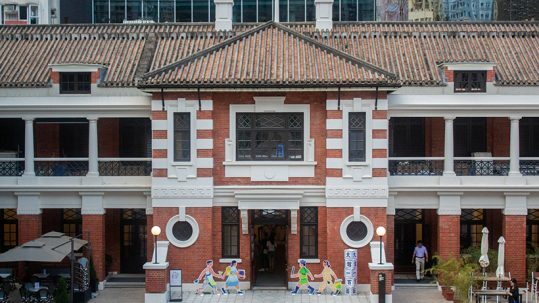 Want to explore more in Sheung Wan and Wan Chai? Download the free iDiscover Hong Kong app to get more information! 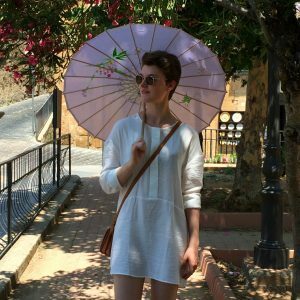 When I travel, I don’t want to be merely a visitor. To create a feeling of belonging, I capture fragments of the places I visit in words. The forgotten story of a building, the smell of the air and the taste of that dish sold on the corner of the street. I would like to show you the people and places that stick with me when I move on to my next destinations.